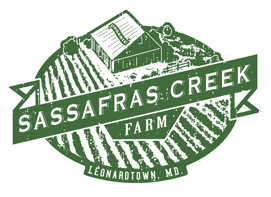 David and Jennifer Paulk own and operate Sassafras Creek Farm. David is the full-time farmer and was inspired to start farming after his Navy career. He enjoys studying farming techniques, trying new vegetable varieties, and teaching others about small scale vegetable farming. Jennifer is the brains behind the farm. She does planning, harvesting, greenhouse work, selling, and bookkeeping. In addition, she is a University of Maryland Agricultural Extension Master Gardner and works full-time off the farm for the Navy as an environmental scientist. Jennifer especially enjoys talking with customers at the farmers market about preparing delicious meals with our fresh vegetables. Harry, as in Dirty Harry, and Zoe, are our pet cats at Sassafras Creek Farm. Harry, like his namesake is fearless, dislikes rules, and sees the world as black and white. Zoe, is Harry's little side kick and she can be seen following him around getting into trouble. Both are funny and love to play. Kelly hails from the Annapolis area and joins the farm this year as a full time employee. She has experience farming last season in Massachusetts on a diverse vegetable CSA farm. Ivy joins SCF this season after several years experience farming in Virginia and Georgia. Originally from Indiana, she now makes her home in beautiful St Mary's County. Ivy enjoys baking and spending time with her boyfriend Ben and her friendly dog Melvin. Amanda returns for her second year on the farm helping part-time harvesting, planting and at the farmer's market. She also helps out at the BAE Farmer's Market. She loves to cook and is passionate about getting her hands in the soil. Jena returns for a second year on the farm as part time farmhand and farmer's market assistant. She enjoys working in the greenhouse, packing shed and on-farm pot-luck Thursdays! Mary returns to the farm in 2018 as a part time farm worker. She recently became the St Mary's County Master Gardner Coordinator! While on the farm, she still is the go to person to help oversee planting, harvesting, cultivation and greenhouse production. She also helps several times a month at the BAE Farmer's Market. Mary has extensive experience as a business owner in the horticultural and landscaping field in Massachusetts. She calls southern Maryland home and in her free time she enjoys running, vintage furniture and spending time with her husband and son. Her favorite vegetable is the tomato.